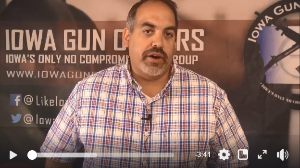 By now you’ve likely heard about the SIG P229 giveaway that Iowa Gun Owners is conducting. But just in case you have missed out on this, we have produced this video update for you explaining what’s at stake here in Iowa. You can watch that right here! Simply put, it’s decision time for gun owners in Iowa. Are we going to sit back and hope for the best, trusting that our legislative majorities will hold and that we can try for Constitutional Carry again next year? Or are we going to stand up and fight against the out-of-control media here in Des Moines, anti-gun lawmakers, and Bloomberg-backed organizations who want to destroy our gun rights? And remember, any contribution you can make to help Iowa Gun Owners defend the Second Amendment in Des Moines would be most appreciated. But, during this special program, any contribution of $35 or above comes with a FREE IGO T-Shirt and decal! P.S. With critical elections coming up later this fall, will gun owners sit on the sidelines, or stand and fight for the Second Amendment? If you do, your name will be entered into a drawing where you could win a SIG P229 from Iowa Gun Owners! And as a part of this program, any donation of $35 or higher comes with a FREE T-Shirt and member decal from Iowa Gun Owners! Entries must be received by 11:59pm CST on August 3, 2018. Drawing will take place on Friday, August 10 at 12:00pm CST. Not paid for at taxpayer expense. Iowa Gun Owners is a non-profit advocacy organization registered with the Iowa Secretary of State. No purchase or donation necessary to win. Void where prohibited. One entry per person. Must be an Iowa resident to be eligible to win. Winner drawn randomly. Firearms prizes must be claimed through a licensed firearms dealer in accordance with federal and state law. Winner must contact IGO within 72 hours of IGO’s notification to him/her. Firearms prize winners must meet all legal requirements and will be subject to a dealer’s background check. Winner agrees to have his/her name and image used for promotional purposes by IGO and to personally come to The 2nd Amendment Shop in Lohrville, IA to take possession of the firearm.